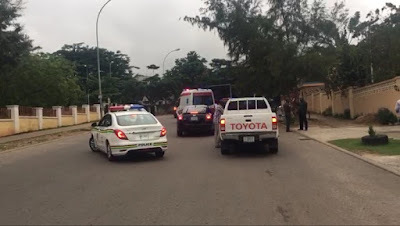 The Nigeria Police Force early Tuesday morning blocked the Senate President Bukola Saraki’s covey from moving out of his residence. The Senate president was sent a late invitation on Monday to report at the Guzape Station in Abuja by 8 am on Tuesday. The invitation was in connection with the Offa robbery attack in which 33 persons were killed. The police said leaders of the robbery gang confessed they had a relationship with Saraki. But the Senate President insisted he knew nothing about the incident. The police had initially blocked Saraki’s convoy thinking he was going to dodge the invitation. He was, however, allowed to exit his residence when they realised he was going to honour the police invitation. Saraki in a statement few after hours after the invitation said the invite by the Inspector-General of Police, Ibrahim Idris, was a ploy aimed at scoring cheap political points. He added that the alleged plot to keep him and his associates in the All Progressives Congress with the case had failed. “I have been reliably informed that the police invitation was planned by IG as a ploy to stop an alleged plan by some senators and House of Representatives members from defecting from the All Progressives Congress.